For investment managers, finding companies that demonstrate potential for high-earnings quality is often a core pillar of any investment approach. However, the real challenge is finding high-quality companies today that will remain high quality tomorrow. Important to the concept of earnings quality is firm profitability, so managers tend to have particular interest in finding companies that can sustain profitability over time. For the most profitable firms, this means defying the relentless competitive forces that work to pull their return on equity toward a marketwide average. One component that provides a critical advantage in keeping these competitive forces at bay and can translate into a "profitability moat" is gender diversity. A considerable body of research shows that firms with more diverse management or boards achieve better financial outcomes as measured by any number of metrics, including superior earnings and return on sales. To build on this, AXA Investment Managers' quantitative equity business, Rosenberg Equities, looked at data on the 1,000 largest U.S. companies from January 2005 to July 2017. The purpose was to add to the existing body of work that highlights the benefits of diversity, and extend it into the realm of future profitability. The study divided companies into higher and lower diversity buckets based on the percentage of women on the board and defined "profitability" as return on equity net extraordinary items, or ROEX, which is defined as recurring earnings divided by book value. Given the results of previously published studies, we were not surprised to find that more diverse companies exhibit higher current (contemporaneous) return on equity. This makes sense when you consider the combined benefits of diversity on attracting and retaining talented employees, strengthening the focus on the customer and improving group decision-making. However, by extending this basic analysis, we found that the most diverse firms not only have higher current ROEX, but their year-ahead profitability is also superior to peers. Turning this simple observation on its side, we isolated those companies experiencing the greatest downward pressure on profitability. This allowed us to determine if partitioning profitable companies by how diverse they are helps identify those that are better able to avoid future mean-reversion pressure. Our findings showed that this is indeed true. It is difficult for the most profitable companies to maintain their top position in the face of competitive forces like substitute products coming to market, pressure to innovate and other companies hiring away their best people. 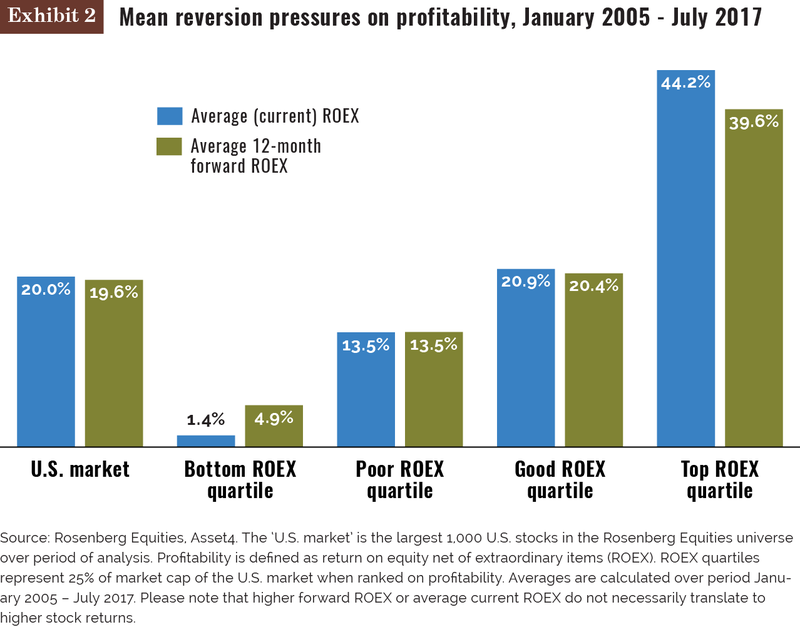 The chart below shows the average drop in one-year-ahead profitability for the companies in the top ROEX portion of the market. Knowing these impacts on future profitability among this group is the reason our study focused on company features that might act as a "moat" to protect against mean reversion. We also found evidence that board diversity can create such a moat. 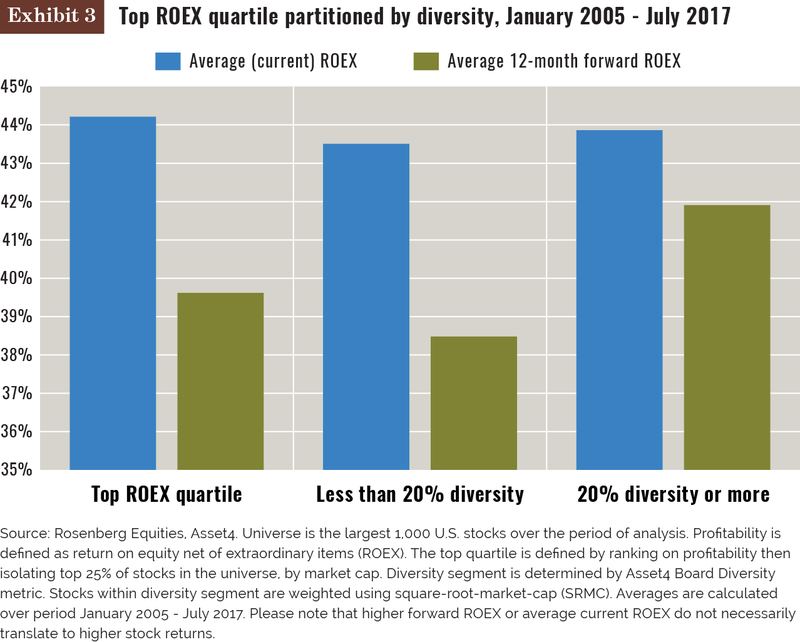 In Exhibit 3, we partitioned the top ROEX quartile into higher and lower diversity groups. Within this most profitable part of the market, the higher diversity companies appear significantly more resilient in the face of competitive pressures, showing a 50% improvement over the average drop. 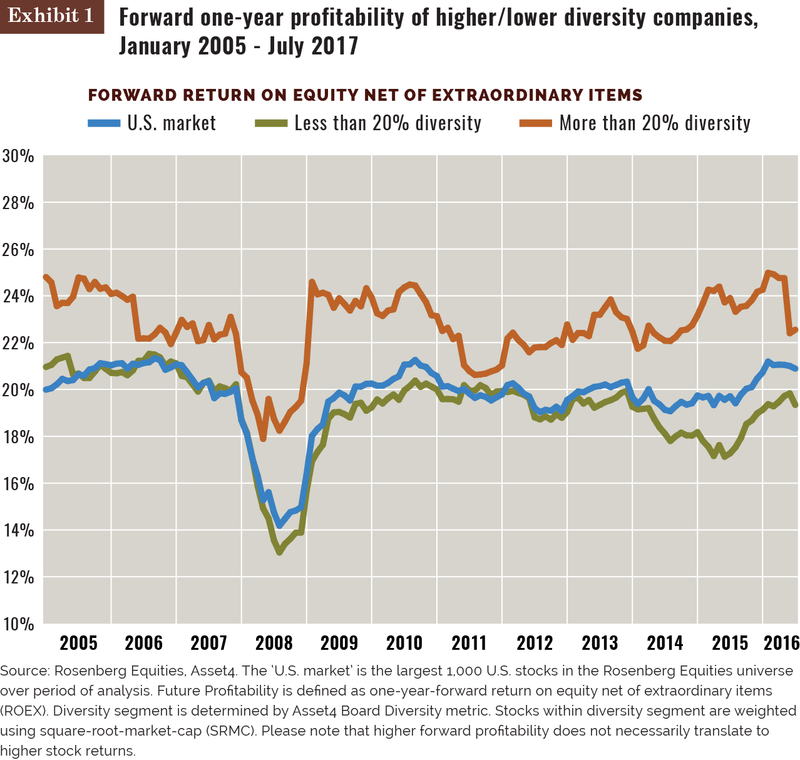 While their forward profitability still decreases, the more diverse companies lose less than their peers. But why would this be the case? A likely explanation is that more diverse firms have advantages when it comes to discouraging new entrants, discouraging brand/product substitution, finding new markets for their products and innovation. The collective intelligence of a more diverse group has the potential to lead to real economic advantages for firms, especially those pressed to maintain top profitability status. It seems clear that ESG concepts such as diversity and governance have a direct correlation with the fundamental drivers of risk and reward in the equity market. The results of this study support the idea that diversity is not just a "nice to have" but instead a "must have" for firms facing the most intense market competition. While this study focuses on gender diversity, we believe that a more holistic definition of diversity is needed overall — one going beyond gender. As a result, the study findings should apply to any group of qualified decision-makers coming from different backgrounds and/or various problem-solving frameworks. Kathryn McDonald is head of sustainable investing and Srilatha Singh is director of earnings forecast models, based in San Francisco at AXA Investment Managers' Rosenberg Equities. This content represents the views of the authors. It was submitted and edited under P&I guidelines but is not a product of P&I's editorial team.